Cognac Hine, for its 250th anniversary, has unveiled Hine 250 – an exceptional cognac presented in a Baccarat crystal decanter signed by Andrée Putman and in a limited edition of only 250 for world-wide sales. “I had to choose a cognac with exceptional qualities,” said Eric Forget, Hine’s cellar master. His choice led him to a barrel containing an eau-de-vie selected in 1953 by François and Robert Hine, who were then running the company. They paid much heed to this specific cask as they decided to put it aside in their family reserve. The particularly difficult weather conditions of this great year have given this cognac qualities that will ensure outstanding longevity. “This Grande Champagne cognac needed 60 years to reach its peak and it is the most exquisite cognac that I have ever tasted since I have been at Hine. The fine harmony of its aromas presents a great richness of fruity flavours, which is quite extraordinary for its age. Underlined by opulent spicy notes, its finish is rich in flavour and very long lasting,” Eric added. The project to create this decanter goes back to 2005 when Andrée Putman came to Jarnac after accepting Bernard Hine’s proposition to create the Hine 250 decanter, which perfectly reflects the Putman studio’s philosophy: look for elegance and simplicity, become omnipresent in the disappearance, work on the eclipsing rather than the effect. “I designed the presentation case as a cocoon for this exquisite decanter. The shape follows invisible axes and there is playful dialogue between glass and mat, opulent and ascetic. I opted to erase asperity and soften the whole effect. 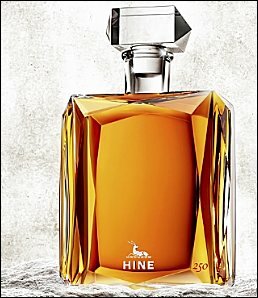 It is a kind of a rough diamond, which, when cut, reveals the treasure it holds: the Hine 250 decanter. This is also a sustainable case as it is not just a case: it is also designed to be a luxury jewellery box and can enjoy a second life,” said Olivia. François added: “We chose a cognac anthology to accompany this decanter’s amazing shape. We would like to reserve the very first edition of this decanter for Her Majesty Queen Elizabeth II who, since 1962, has granted the Royal Warrant as official cognac supplier. To this day, Hine is the only cognac House to have the Royal Warrant, of which we are particularly proud. “Thomas Hine was a British citizen and the English market has always been very important historically for Hine”. The Hine 250 decanter will be available for shipment to the different markets in autumn 2013. RRP from €10,000.